The WCSA is a crossroad of large quantities of natural and anthropogenic aerosols of distant and local origins (biogenic, anthropogenic, biomass burning, sea salt and mineral dust) from continental and marine sources These aerosols have significant differences in terms of physico-chemical and optical properties, water affinity, scale and height of transport. Southern Africa is the major global biomass burning source region (van der Werf et al., 2010). Forest fires occurring in the austral dry season (August to October) contribute to the regional aerosol load with thick and wide-spread smoke layers of high optical density, generally lofted above the Sc (Lindesay et al., 1996; Swap et al., 2003). The annual emissions of mineral dust from southern Africa are around 2300 Mg, equating to approximately 5% of the global annual emissions, of the same order of magnitude of those from major recognized sources regions in Arabia and the deserts of East Asia (Ginoux et al., 2012). Namibia, an arid environment, is the largest source region of mineral dust in southern Africa. Here, Vickery et al. (2013) identified approximately 70 emitting point sources (mostly ephemeral dry riverbeds along the Namibian coastline), beside the major source of the Etosha Pan. The deposition of nutrients from mineral dust could contribute significantly to the coastal oceanic primary production (Dansie et al., 2017), but the long-range transport of mineral dust from Namibia to the central tropical South Atlantic is also documented (Swap et al., 1996). Anthropogenic aerosols are expected to the anticyclonic episodic long-range transport of industrial aerosols from South Africa (Formenti et al., 1999; Piketh et al., 1999), one of the largest industrialized economies in the Southern Hemisphere, and to increasing maritime ship traffic (Tournadre, 2014; Johansson et al., 2017). Finally, deep-water and coastal upwelling and wind friction on the sea surface emit marine biogenic aerosols and sea salts (Andreae et al., 1995). 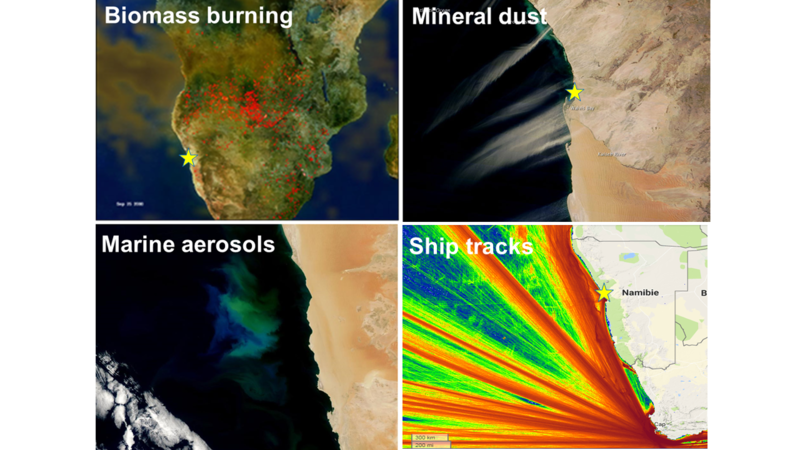 Satellite and in situ observations document the extraordinary primary activity of the nBUS and the occurrence of extended and persistent blooms of phytoplankton offshore Namibia (Verheye et al., 2015). The early phase of the phytoplankton lifecycle is associated with high concentrations of dimethylsulfide (DMS) in both water and air (Andreae et al., 1994, 1995; Bates et al., 2001). The senescence of phytoplankton is accompanied by intense emissions of other sulfur species, and in particular hydrogen sulfide (H2S), at times visible in water color images for several weeks (Weeks et al., 2004; Ohde and Dadou, 2018). The anaerobic decomposition of sediments can create a “diatom mud” rich in organic matter along the Namibian coast (Borchers et al., 2005).